Moneyball may be about an old pastime, baseball, but it's reminiscent of a film about a more contemporary activity: The Social Network. Both are about Gen-Y whiz kids rising up and training their trumpets on the walls safeguarding venerable Jerichos—in Social Network it was Madison Avenue, while Moneyball looks at how detailed statistical analysis shook up the tradition-laden world of major league baseball. As it happens, Aaron Sorkin, last seen accepting a screenplay Oscar for The Social Network, also revised writer Steve Zaillian's treatment of Moneyball. The long-gestating Moneyball film project, directed by Bennett Miller (Capote), adapts Michael Lewis' 2003 book about the Oakland Athletics and its general manager Billy Beane, who adopted the principles of "sabermetrics" in identifying undervalued baseball players as a means for cash-strapped clubs to compete with rich rivals like the New York Yankees and Boston Red Sox. 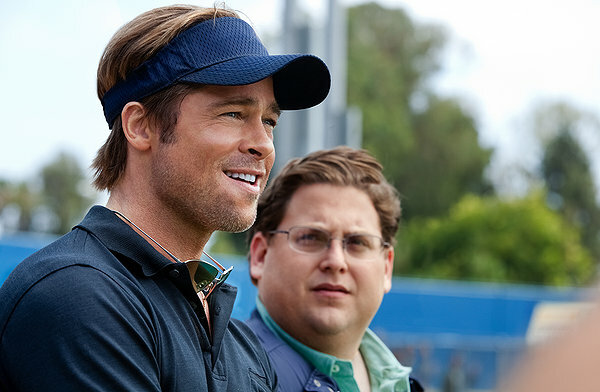 Along the way, Beane (played by Brad Pitt) challenges the sport’s sacred cows, including his own scouts and head coach (Philip Seymour Hoffman, giving little to do besides scowl a lot), who resent the radical redefinition of an archaic system of player evaluation foisted by Beane and his Yale-educated assistant, Peter Brand (Jonah Hill). Moneyball is an enjoyable, entertaining movie thanks to breezy dialogue (Sorkin’s unmistakable contribution) and the performances by Pitt and Hill. Their contemporary Abbott & Costello act guide the film, with Beane as the competitive, jocular ex-jock and a Brand as the portly egghead. Hill, best known for his Judd Apatow comedies, impresses in his first high-profile dramatic role. And while those who contend age has finally turned Pitt into a good actor didn’t pay attention to his mid-90s turns in 12 Monkeys, Fight Club and Kalifornia, what has changed is that the 47-year-old actor now sports a more weathered visage for the camera to exploit. Still, that recommendation remains equivocal, as Moneyball is also a flawed work that fails to emulate the moxie of its protagonists. The film focuses primarily on Beane, a divorcé whose teenage daughter periodically pops up to strum a ditty she composed about dad that sounds like a B-side off the Juno soundtrack. Beane’s own playing career was a washout, and the most intriguing moments of Moneyball are those that wonder whether his embrace of computer statistical analysis is his way of exacting revenge on the stodgy scouts who once imprudently advised him to turn down a college scholarship in favor of a pro contract. However, it’s Brand who is the purveyor of this new system, making the script’s failure to develop his backstory an egregious omission. This is particularly puzzling since Brand is fictitious character (Paul DePodesta, Beane real-life right-hand man, figures in Lewis’ book but asked that his name not be used in the film), leaving the filmmakers free to explore why a nerdy, seemingly nonathletic Ivy Leaguer would apply his gifts to baseball analysis. Was it to get back at the jocks who teased him as a child, his way of fitting into a long inaccessible world, or something else? The possibilities are rich, but unfortunately the payoff is miserly. The climax to Moneyball boils down to a will-he-or-won’t-he affair over whether Beane would accept a lucrative offer from the Red Sox and their owner John Henry (Arliss Howard), whose soliloquy on the sea change brought by sabermetrics is a highpoint. The sequence is meant to call-back the last time Beane had to decide whether or not to take the money. A more skillful treatment, however, would have turned his conversation with Henry into a tragic arc, the moment Beane realizes this new method developed to level the playing field for the have-nots is destined to be co-opted as yet another weapon for the benefit of wealthy haves. Like a batter checking his swing, Miller seems torn between the crowd-pleasing tropes of the baseball movie genre – the Big Hit in the Big Game – and a commitment to distilling the sport down to a binary essence. Indeed, the film teaches us little about the particulars of sabermetrics (the term itself is never uttered), leaving the viewer to sometimes wonder what all the fuss is about. There’s nothing in Moneyball as metaphorically audacious as the dueling frat parties in The Social Network – one a stereotypical bash where girls are bused in to serve as objects of drunken revelry, the other an online gathering where the coeds’ digitized images are uploaded and ranked by participants according to their relative attractiveness. The most subversive Miller ever gets in Moneyball are slow-motion montages of batters taking a base on balls. In the end, the film is much like a sporting event – a lot of fun but ultimately a finite distraction.